Pick up any modern printed book at random and open it up at front. Flip past any completely blank pages until you get to the first page with any text on it, e.g. 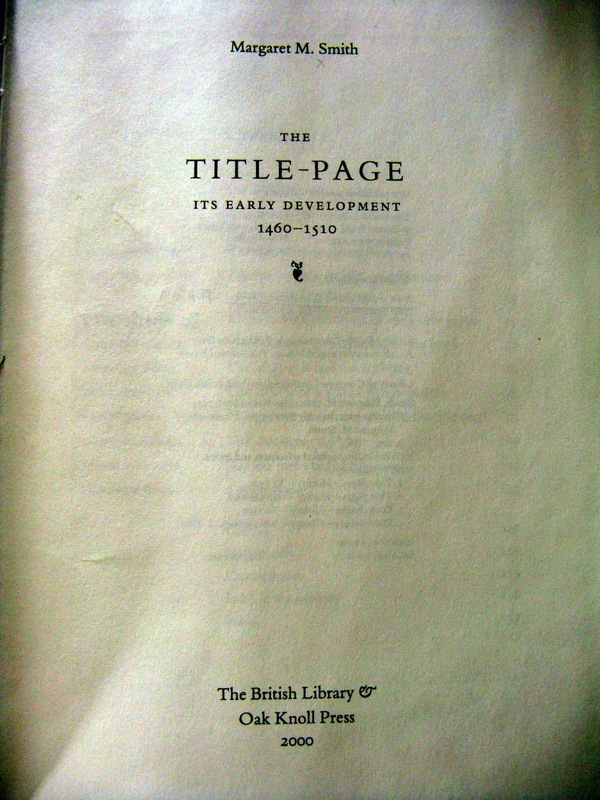 The title page developed only after the invention of print technology. The title page is a feature of the modern printed book that, I suspect, we take for granted: of course books have title pages. But medieval books did not. The title page developed only after the invention of print technology. Why it did so gives us a clue to answering the question of exactly what difference print really made to the form and function of the book. Books, in the Middle Ages, were mostly custom-made objects; many people served as their own amateur scribes, or a professional scribe or scribes might produce a book to order. In the late Middle Ages there were certain types of texts that a scribe could produce many copies of and be fairly sure of being able to sell: missals, breviaries, books of hours, law books, university textbooks, Bibles. These, rather than what we might today consider ‘literary’ texts, also became the staple output of early printers. However, the process of producing a manuscript book – by definition a unique, hand-made object – was time-consuming and it was not likely that anyone had stacks of books sitting around in a shop, ready for sale. Furthermore, assembling a book was somewhat of a do-it-yourself affair; one would create, acquire, or purchase copies of texts that could later be bound together. In this model of book production, text boundaries were often fuzzy and negotiable. One effect of print technology was to commercialise book production to a greater extent than had been possible before. This meant that it became more likely that a printer might have copies of a text sitting about in the shop, unbound, ready for shipping, binding, or sale. It was probably the practice to place such copies within a protective blank sheet so that the first and last pages would not be rubbed or soiled during storage or transport. It then became useful to write or print, on these blanks, a phrase or description of the text underneath. 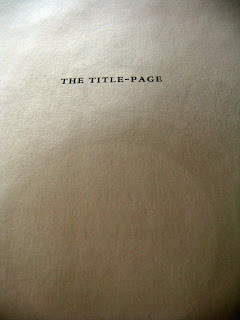 This ‘label-title’, to use Margaret Smith’s term, was the origin of the title page. But already, in this very early example of a title page, we see that the printer is thinking not only of his own convenience in labelling and storing his product, but also of his prospective customer; he did not have to tell himself that the book was ‘passing gode’, or ‘necessarye & behouefull’, but those would have been good selling points to catch the eye of a buyer. It was not long before printers made further use of this space not merely to label a text but also to advertise the book and, incidentally, themselves. The title page eventually acquired woodcut illustrations, the author’s name, the printer’s name and/or mark, the bookseller’s name and address, the place and year of publication, decorated borders, epigrams or mottoes, and often descriptions or lists of the book’s contents. Pynson’s Canterbury Tales (1526). Image: Glasgow University Library. The title page, a standard element of book design today, thus began not as a means of aiding the reader, but as a side effect of the production processes associated with print, and then as a means of helping to sell the printed book. In other words, it suggests that the most significant impact of print technology on the form of textual information was not on the design of the book but on the economics of its production and distribution. In this case at least, if printing changed the design of the book, it did so not in order to improve functionality but in order to boost sales. The invention of the title page also signalled a shift toward a different way of thinking about textual identity. The economics of print encouraged people to think of texts as being coincident with books: that is, a book, a physical object, became a labelled container for a text, a linguistic/information object. The physical boundaries of the book became the conceptual boundaries of the text that the book contained. For the printer, and thus for his customer, the book was a marketable unit, and was packaged accordingly. And the packaging was controlled, more than ever, by the producer of the book, not by its user. 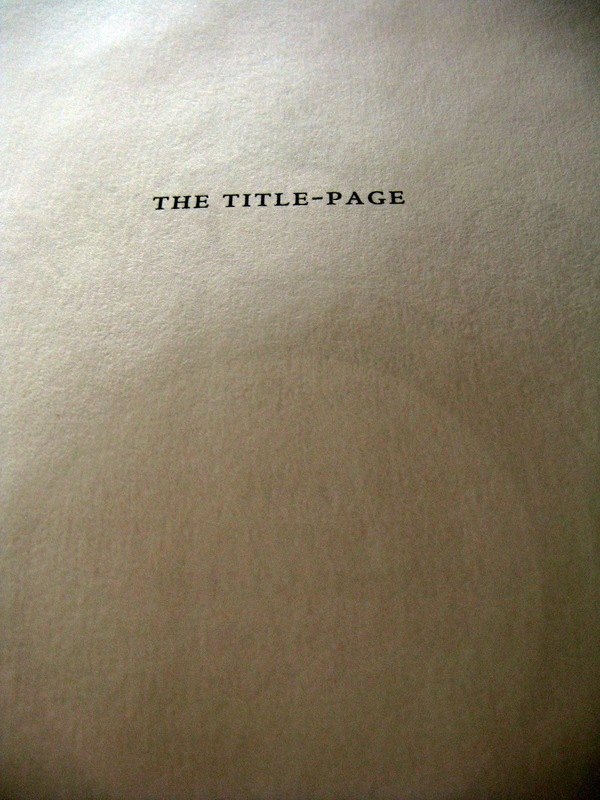 The most comprehensive account and analysis of the history of the title page is Margaret M. Smith, The Title-Page (2000), the title page of which (in my copy) is reproduced above. Also helpful, for the economics of the early history of print in England, are David McKitterick, Print, Manuscript, and the Search for Order, 1450-1830 (Cambridge: Cambridge University Press, 2003), and many of the essays in William Kuskin, ed., Caxton’s Trace: Studies in the History of English Printing (Notre Dame, IN: University of Notre Dame Press, 2006), including Kuskin’s Introduction. For the conditions of late medieval manuscript book production, a great deal of good recent scholarship has been produced; see, for example, Linne R. Mooney, ‘Locating Scribal Activity in Late-Medieval London’, in Margaret Connolly and Linne R. Mooney, eds., Design and Distribution of Late Medieval Manuscripts in England (York: York Medieval Press, 2008), 183-204. I am indebted to Medieval Codes student researcher Corie Wiebe for gathering material and helping me to think through these ideas in many ways.